You may download a PDF version of the above video presentation. Click here to download. 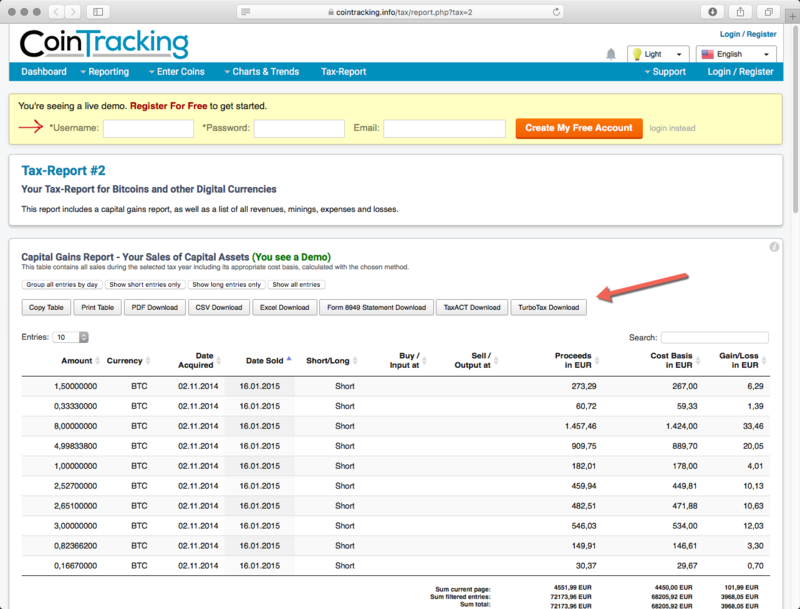 CoinTracking provides a downloadable tax exchange format (TXF) file — but does not offer an OFX server. As such, you can import your sale data into TurboTax Desktop editions — but not TurboTax Online edition. Form8949.com can help. You download a TXF file from CoinTracking and then submit it for processing by our program. You can then electronically import your data directly into TurboTax Online from our OFX server. From the menu select "Tax-Report"
Scroll down to "Overview of all created Tax Reports"
Scroll down to "Capital Gains Report - Your Sales of Capital Assets"
Open our web application and select Upload TXF from the sidebar. Follow the remaining instructions in the app.